« If you love me, Shut It Down! Bradley Manning, the American soldier accused of being the source of the biggest leak of US state secrets in history, was on Thursday formally charged with aiding the enemy, during the first day of his court martial. If found guilty, he faces a maximum sentence of life in military custody with no chance of parole. The charges against the former army intelligence analyst include: aiding the enemy; wrongfully causing intelligence to be published on the internet knowing that it is accessible to the enemy; theft of public property or records; transmitting defence information; and fraud and related activity in connection with computers. The documents he is alleged to have dumped on Wikileaks, the whistleblowing website set up by Julian Assange, included Afghan and Iraqi war logs, more than 250,000 diplomatic cables from around the world, and a classified military video of a US helicopter attack on civilians in Iraq that killed 11 people, including two Reuters employees. Wearing his green army dress uniform and heavy, dark-rimmed glasses, Manning sat though most of the 45-minute hearing at the Fort Meade military base in Maryland with his hands clasped. He was flanked by three lawyers, two military – Major Matthew Kemkes and Captain Paul Bouchard – and one civilian, David Coombs, his defence lawyer. Manning spoke in a clear voice, to answer “Yes, your honour” when asked if he understood proceedings. Coombs brought up his client’s due process rights and told the military judge, Colonel Denise Lind, that he would object to any delay in the trial past June. Manning was held at Quantico marine base in Virginia and then at Fort Leavenworth. He is currently being held locally. Coombs said that, while the government had cited the complexity of the case and the difficulty in co-ordinating agencies, “the defence would argue that due process rights of my client” had not been satisfied. Under the US constitution, a court martial must be brought within 120 days of charges being preferred. Manning’s 120 days, known as his “speedy trial clock”, began in May 2010, when he was arrested in Iraq, according to the military. The military insisted that the extra time taken to come to trial owed to requests by Manning’s own defence team, and the period in which classified documents were being handled. A military legal expert said that the delay of a plea and forum decision was usually a strategic one, while lawyers wait to see how the motions they have filed are dealt with. During the hearing, Manning’s defence filed six motions, which included pre-trial publicity; how classified documents would be reviewed; and compelling disclosure. The government filed one motion, concerning the protection of government documents in the hands of the defence team. The next court hearing was set for 15-16 March, when the motions would be heard. At one point, Captain Ashden Fein said there had been an “inadvertent spillage” of classified material by the defence team. Later, a military legal spokesman explained that this was because of material containing classified information being sent over an unclassified system of email. The defence denied that a spillage had taken place. Security at the hearing in Fort Meade was slightly more relaxed than the pre-trial hearing in December, although journalists at an annexe to the court were not allowed to disseminate information via social media while the hearing was in progress. At a preliminary hearing in December, military prosecutors produced evidence which they said showed Manning downloaded material and electronically transferred it to WikiLeaks. They said his computer logs were littered with material related to the leak, and that he had been in direct contact with Assange. Coombs, Manning’s lawyer, said that others had access to the soldier’s work computers in Iraq. Coombs said Manning was emotionally troubled, had confused sexual and gender identities at a time when the US army had a “don’t ask don’t tell” policy barring gay personnel from openly serving in the military. Manning’s defence team also said he should not have have access to classified material because of his erratic behaviour and increasingly violent outbursts witnessed by his superiors. It also argued that the material published through Wikileaks did little harm to national security. Call your government representative. Dismiss all the charges against Bradley Manning. Every week from now until the court martial the Bradley Manning Support Network will be asking supporters to write or call individuals and organizations influential to the trial. Pfc. 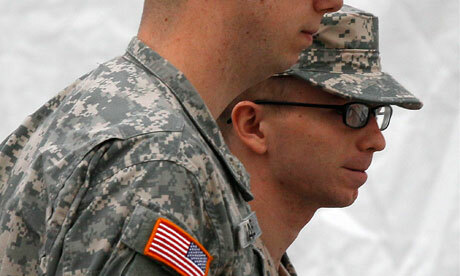 Bradley Manning, an alleged WikiLeaks whistle-blower, will be formally arraigned on the 23rd of February. While his presence in the courtroom will be brief, the arraignment sets in motion Manning’s court martial, which is currently expected to begin in May. With this in mind we are requesting that supporters write, email, and call their local representatives to express their outrage over the charges against, and the treatment of, Pfc. Bradley Manning. The military court proceedings have thus far been for show, but we can still ask our elected officials to protect whistle-blowers and to pressure the Obama Administration to drop all the charges against Bradley Manning. 1. It took a year and a half to get to the pretrial hearing, and once there the military selected an Investigating Officer from the same department investigating WikiLeaks. This is not justice. 2. Military officials are refusing to allow access to key witnesses and evidence. The only witnesses called by the defense who will be allowed to testify are those who have also been called by the administration. They have blocked critically important evidence — such as internal administration WikiLeaks impact assessments — from being considered in open court. This evidence could have contradicted the government’s ridiculous “aiding the enemy” charge. 3. Whistle-blowers are essential to a vibrant democracy. Secrecy is not the answer. Laws must be implemented to protect whistle-blowers. Blowing the whistle on war crimes should not be a crime. Why was this material classified in the first place? The classification of government documents should not be used to cover up crimes. 4. Eight months of solitary confinement is torture. The Obama administration has repeatedly denied the UN Special Rapporteur on Torture, Juan Mendez, from access to a private visit with Bradley Manning. Why has Bradley Manning’s treatment been so severe? Why is Bradley Manning being denied a confidential visit with Juan Mendez? Stop the retaliation against whistle-blowers. Drop all charges against PFC Bradley Manning! Call your local representative and ask them to raise the issue of Pfc. Bradley Manning’s unjust treatment. Tell them justice is not being served. Please write, tweet, email, call, and otherwise share your experience. Let us know how your representatives have responded. Bradley Manning’s supporters are listening, and it’s time for the government to do the same. House of Representatives Contact Information. International supporters can raise the issue with the nearest US Embassy.